This was my third trip to the big show, and it did not disappoint. I saw plenty of cool stuff and met with people I never see outside of these shows. First the gear, then the people. This is just a sampling of what I saw, things that caught my eye. I've been using Capo for several years. The developer, Chris Liscio, was a StevieSnacks fan before I became his customer. This was our first time meeting in person. 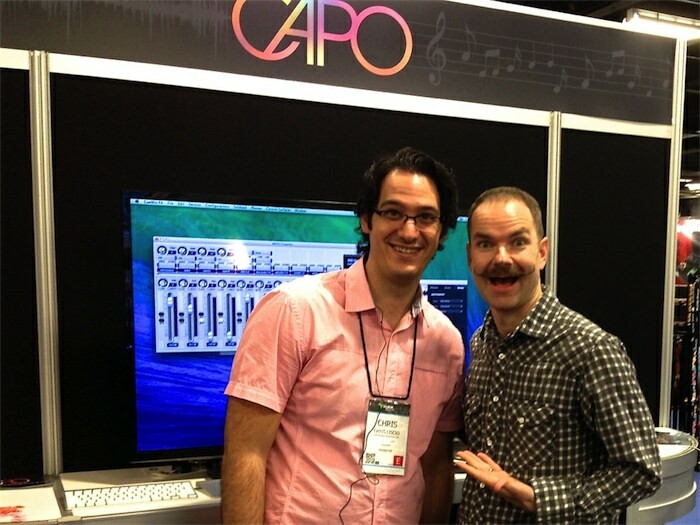 Capo is getting noticed by pro musicians, and deservedly so. Chris is a genius and the software keeps getting better and better. Pictured is Chris (left) and Brandon Bush (right), keyboardist for the band Sugarland. The Headload is the most advanced loadbox/attenuator I've seen. The attenuator section sounded pretty good (it was loud everywhere so I couldn't listen very closely). 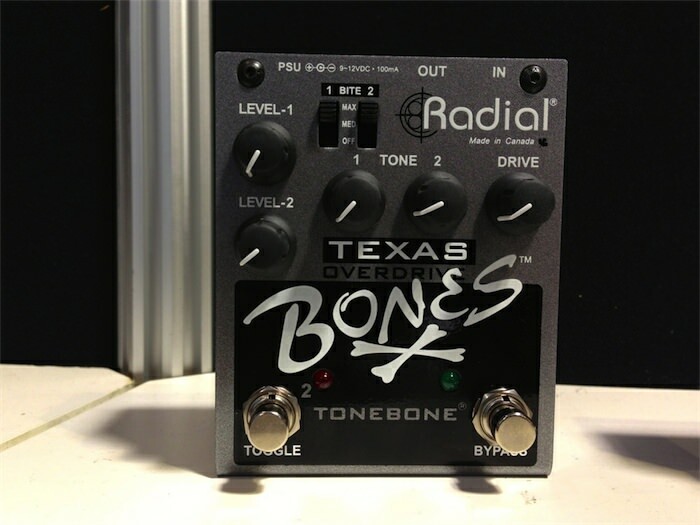 Radial has built their popular JDX Direct Box right into the Headload. 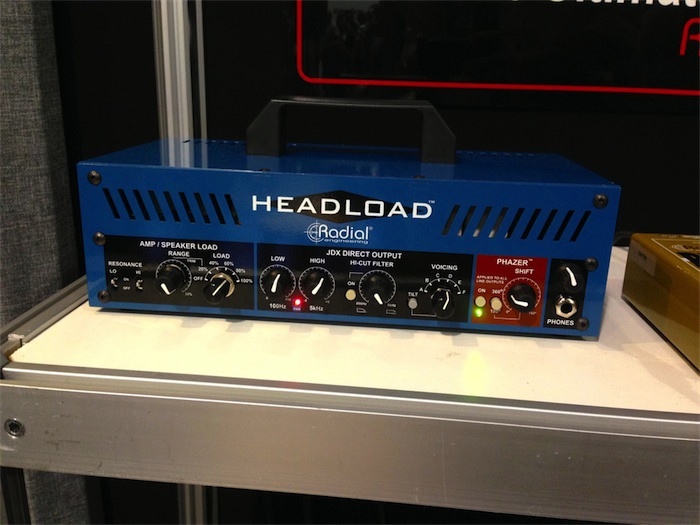 This gives you a really high quality line-level output for a PA system or for recording. The JDX section has tone shaping controls, plus a phase adjustment which controls the phase difference between the speaker output and the JDX output. 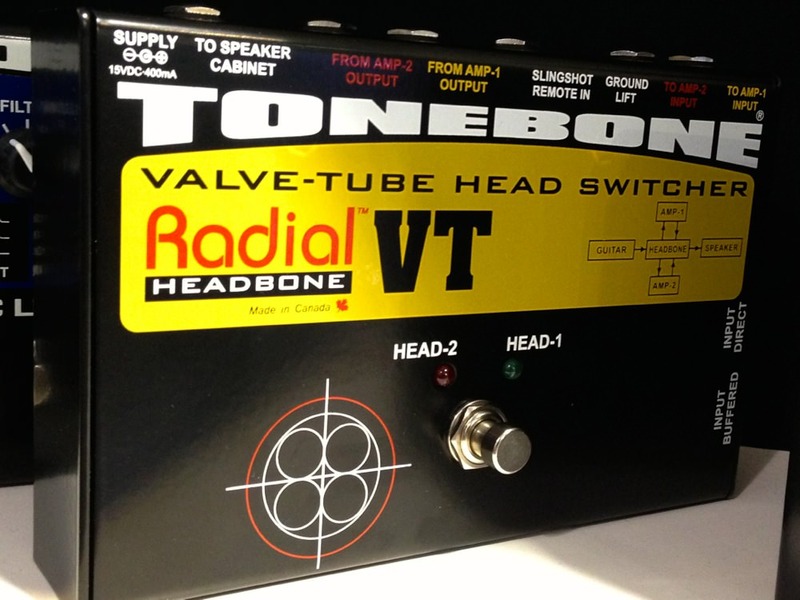 This pedal does the unenviable task of switching two live amp heads into the same cabinet. 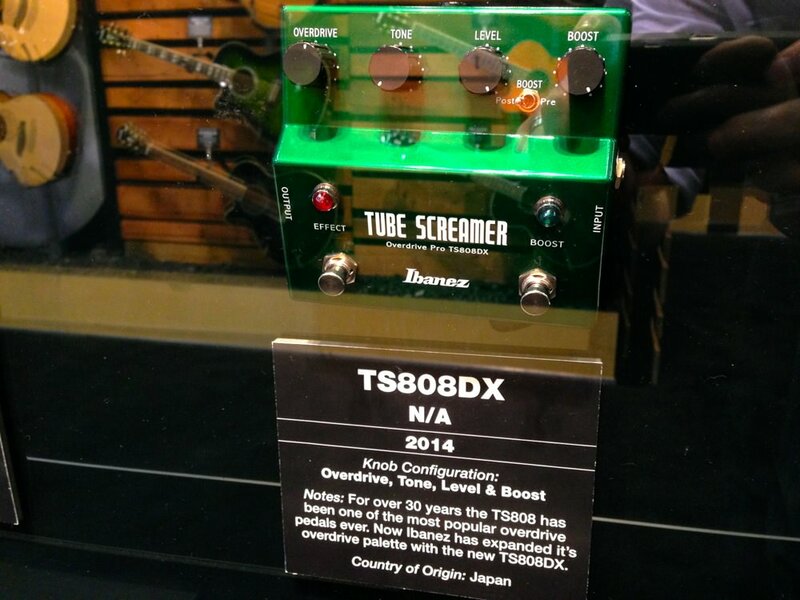 If you know anything about how tube amps work, you know how crazy that is. The Cab-Bone is the inverse of the Head Bone. 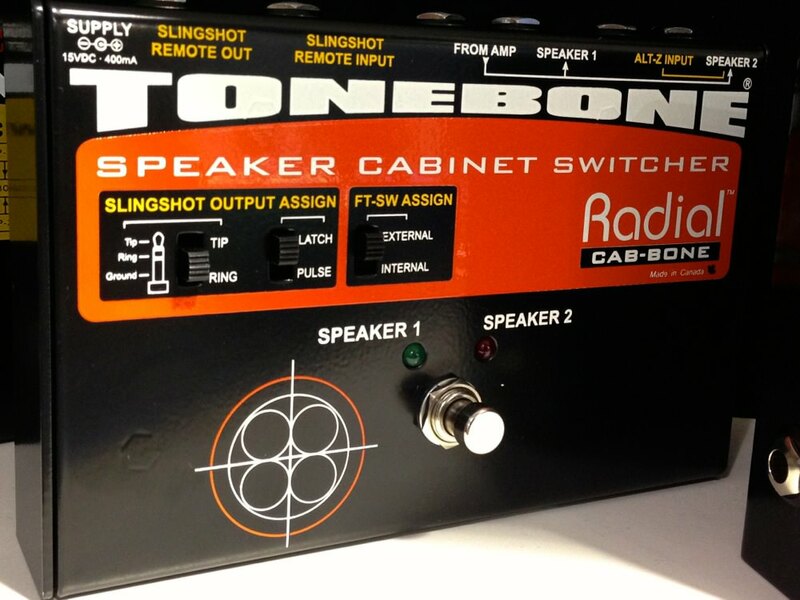 It switches one amp head into two different cabinets. I'm a sucker for any pedal with Texas in the name. There was no way for me to try this out, but it's got some cool features. If you've tried it, let me know what you think. What a fantastic product this is. When you've got a sensitive microphone on a mic stand, every bump or vibration in the floor is transferred up the stand, into the microphone. 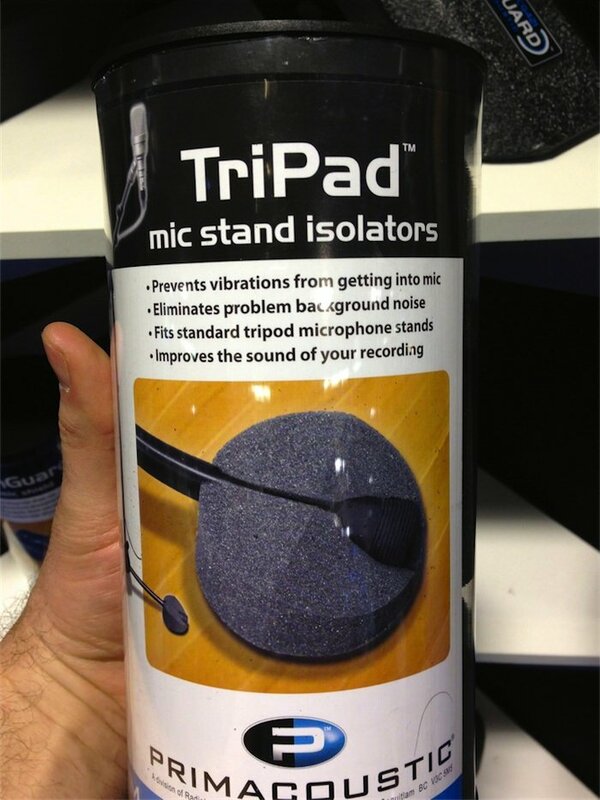 TriPads solve that problem. The tripod, or mic stand feet slip into the foam 'slippers', and the foam absorbs the vibrations from the floor, isolating the mic stand. This is another great idea from Primacoustic. Mic'ing drums is hard. The cymbal crashes bleed into the drum mics so the sound man can't increase the volume of the drums without also increasing the volume of the cymbals. 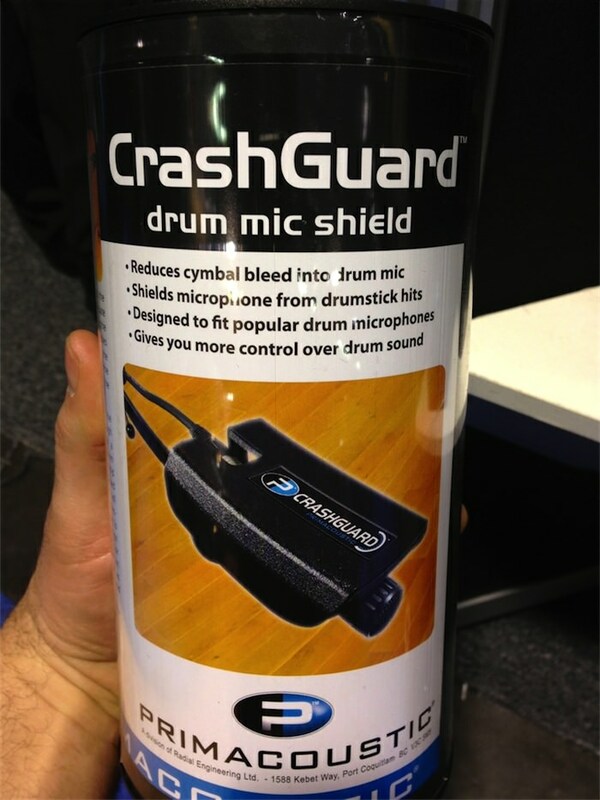 The CrashGuard solves this problem by acoustically shielding the drum mics from above. This shielding reduces the amount of cymbal noise picked up by the microphone. The Fender Deluxe, a legendary amp, has always been shipped as a 1x12 combo, until now. 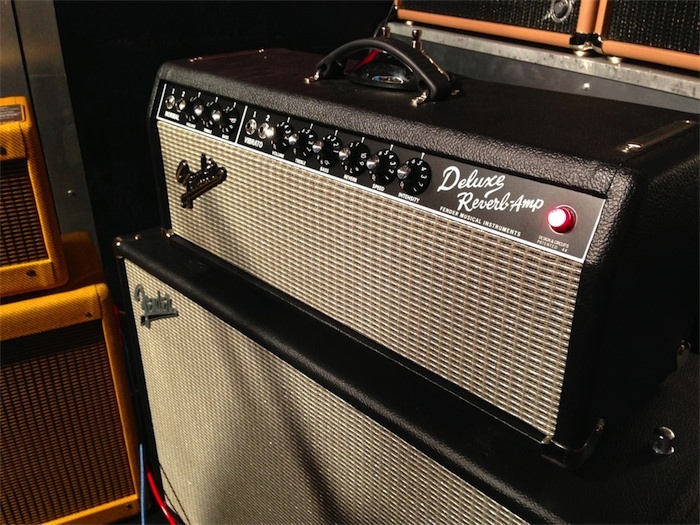 Fender has created head versions of the '57 and '65 Reissue Deluxe amps. Putting a Deluxe Reverb head through any cabinet I want? Don't mind if I do. 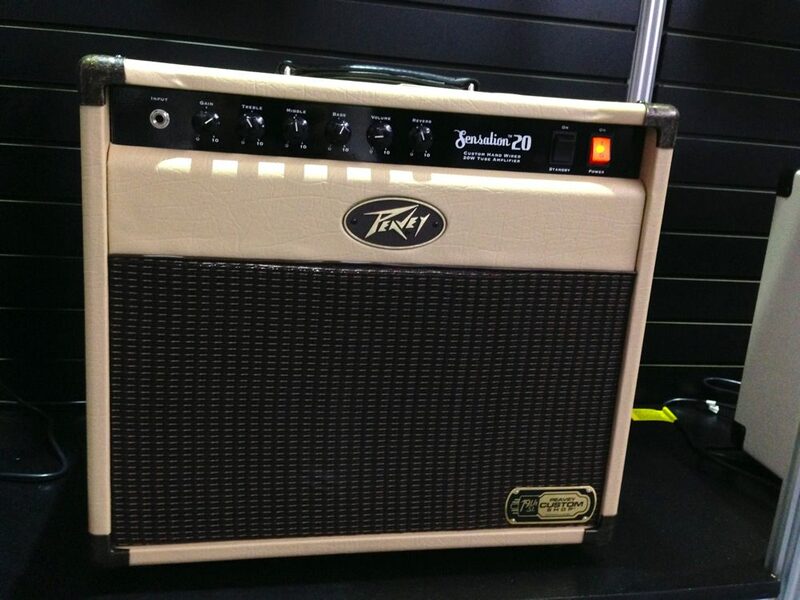 Fender has introduced two new Pawn Shop series amps. This is the Vaporizer. I don't know much about it except that it's not going to sound like a typical Fender amp, and that's kind of the point. I really like that Fender is doing some fun stuff in the lower price brackets. 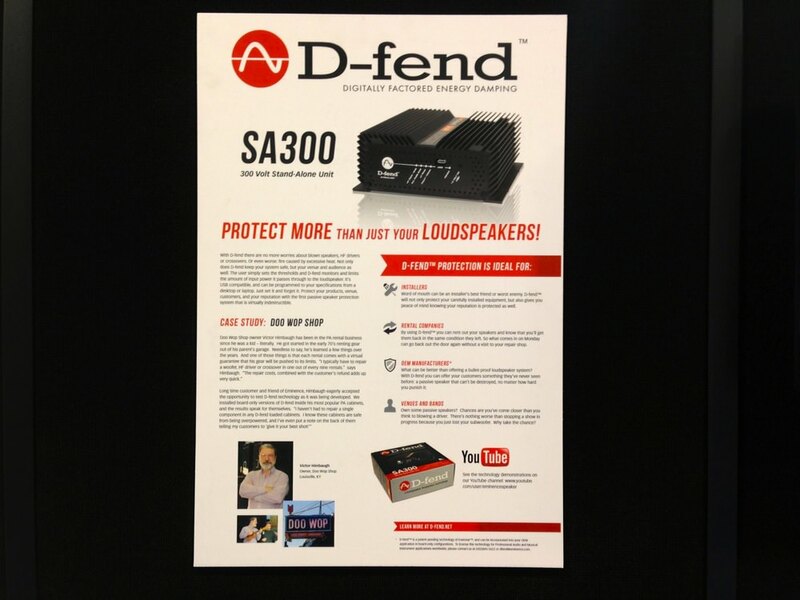 They're making affordable amps that sound great, and are just plain fun. I've only played this amp one time, but I thought it sounded great for the price. These are limited run items, so if you want any of these Pawn Shop amps, you should buy it before it's gone. I own the original Jam Interface and I love it. It sounds fantastic and works equally well for recording (or jamming) on the computer, or on my iPad. Now, Apogee has doubled the sample rate, and improved the circuitry to create the Jam 96. Plus it's shiny. This pedal has been around for a few years, but this was my first time seeing it. The Multidrive is quite unique, combining three distortion circuits into a single pedal. But the trick isn't the number of circuits, it's how they're connected. Virtually every multi-circuit pedal available connects the circuits in series. This creates a first/second situation where one circuit feeds into the next. 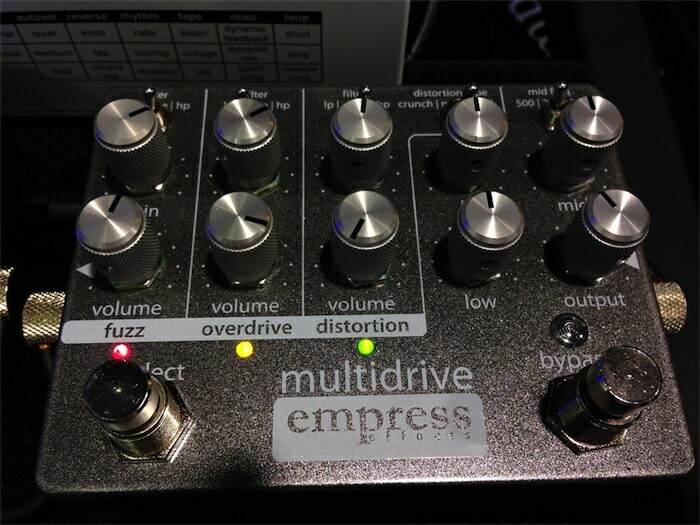 The Multidrive runs all three circuits in parallel, allowing you to mix the outputs together in whatever ratio you want. Why does that matter? Here's why. You want clean lows, but fuzzy highs? Multidrive can do that. You want a mostly clean tone with some heavy fuzz around the edges? Multidrive can do that. You want some ungodly mix of fuzz, overdrive and good old distortion? Multidrive can do that. You want a thick fuzz tone, with a hint of spanky overdrive? Multidrive can do that. I could only play it through headphones, so it was very hard to get a feel for the quality of the circuits. 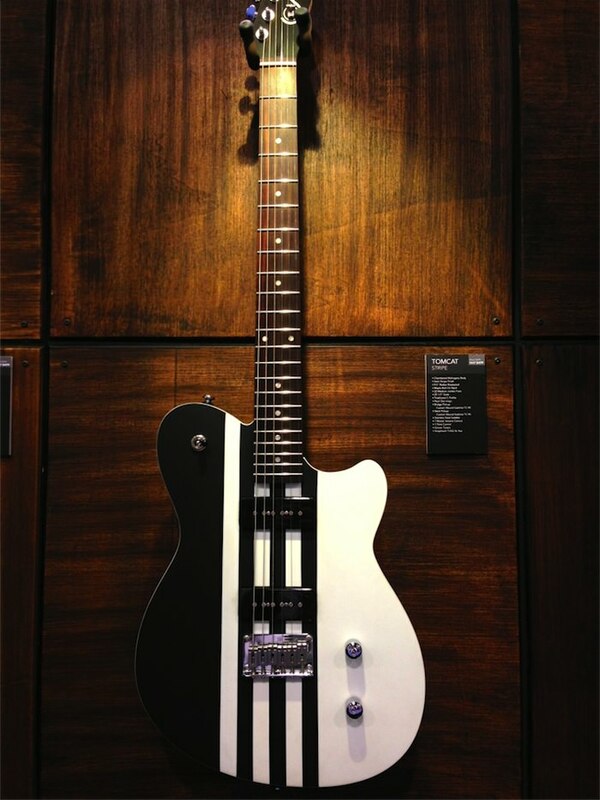 But I love, love, love the design of this pedal and I want to try it. I saw a picture of this guitar posted on Twitter and had to find out who made it. 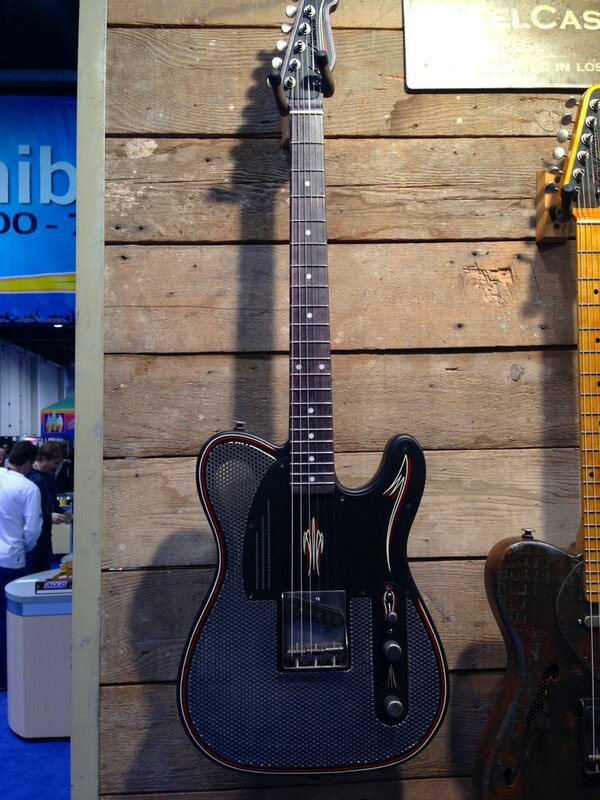 Turns out it's made by Sublime Guitar Company, relatvely new to the guitar scene. The guitar looks even better up close. It plays very nicely, and the chambered mahogany body gives it a nice full lower midrange sound. Best part? It's under $600. I love guitar, and I'd love to share it with my son Austin, but the guitar is not a great instrument for kids. Austin is now 5 years old and he loves his mini stratocaster, but his hands are too small to play anything. 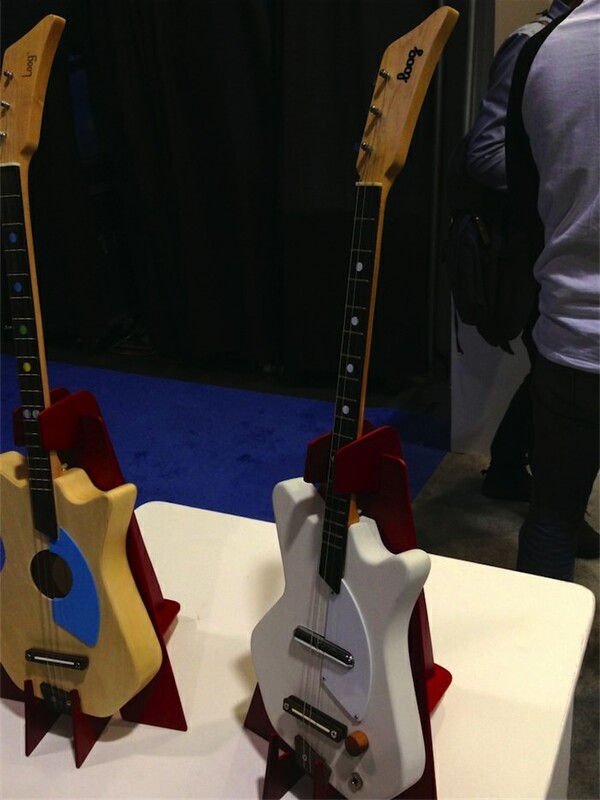 The Loog is a very cool instrument. It only has three strings, which are tuned to an open chord. The neck is perfectly sized for small hands. 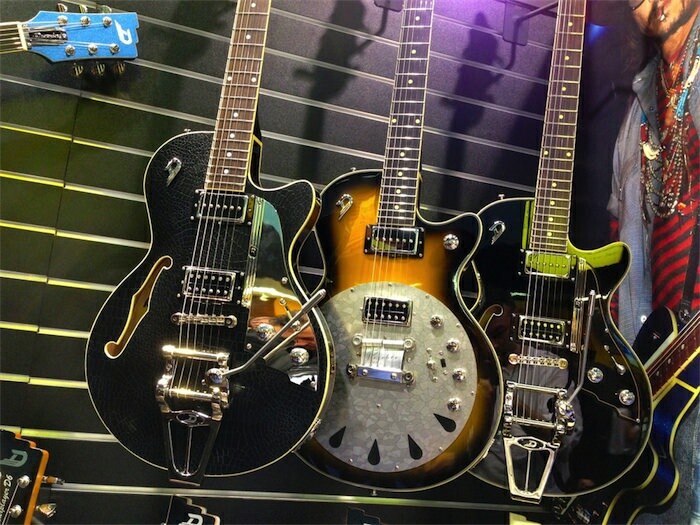 They offer both acoustic and electric instruments (electric available in April 2014) for under $200. The best part (in my opinion) is that you can buy the guitar as parts and help your child assemble it. Kids form much deeper connections with an object when they're a part of the creation process. Ibanez announced the TS808DX Tube Screamer which looks like a Tube Screamer with a boost option. The boost can be inserted before or after the TS circuit. 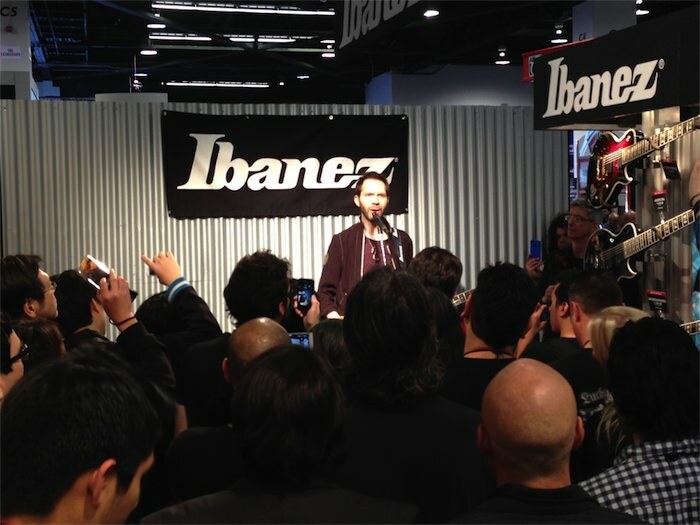 The Ibanez booth is like a museum, you can't play anything. I'd love to tell you how awesome this pedal is, but I can't. I've owned two multi-guitar rack stands, and neither of them was attractive or sturdy. 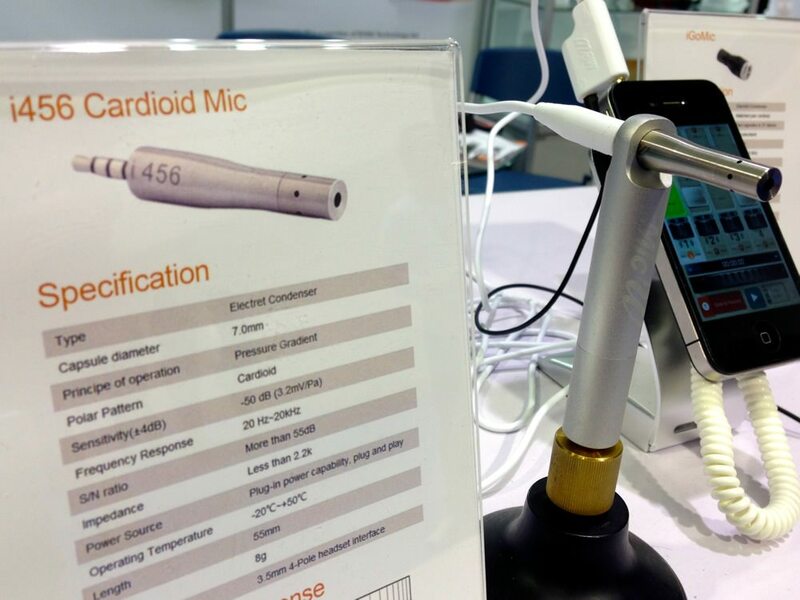 I found this stand at the Kˆnig & Meyer booth. The Guardian 5 stand can hold 5 electric guitars. It is beautiful and sturdy. Every surface the guitar touches is cushioned. I want. This thing got a lot of attention. The Beat Buddy is the first programmable drum machine in the form of a compact pedal. You can also use a double latch pedal to trigger two additional effects - Pause and Cymbal crash. I saw all these features demonstrated by a very good guitarist. 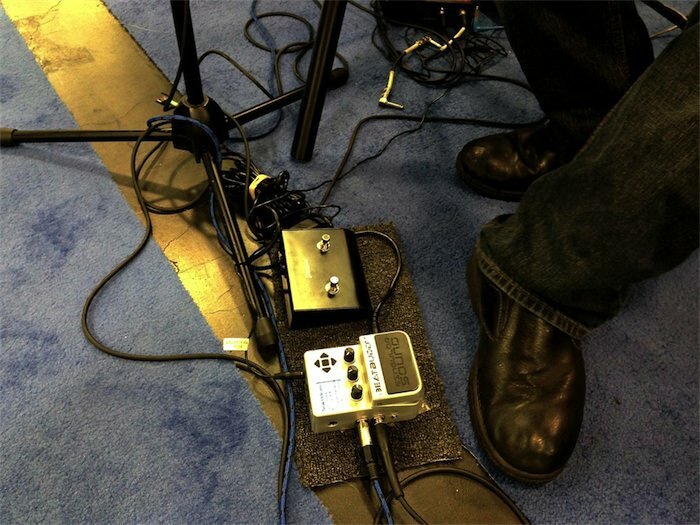 The advantage of the Beat Buddy is that you, the guitarist, can control the flow of the song right from your pedalboard. I'm not suggesting that you fire your drummer just yet, but the Beat Buddy is going to be a legitimate tool for solo artists. I'd love to see them add Bass loop support. The best part (in my opinion) is the desktop software which is available for Mac or Windows. You can build entire songs by defining intro, choruses, verses, and bridges. Then you define a single drum loop as the primary loop, and a few fill loops for each section. Once you've loaded the song on to the pedal, you can navigate the entire song structure by foot. If this thing works as advertised, it's going to be a must-have for any venue with expensive speakers. The D-Fend unit can be configured using desktop software. I assume the configuration parameters are related to the speakers it will be connected to. 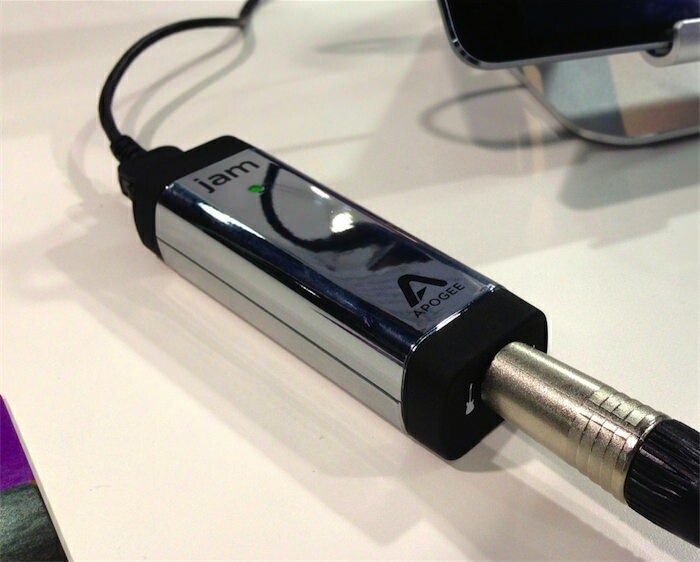 This is a tiny condenser mic that plugs into the headphone jack of a phone or tablet. It can connect directly to the jack, or through an extension cable. This would probably be a great tool for interviews. 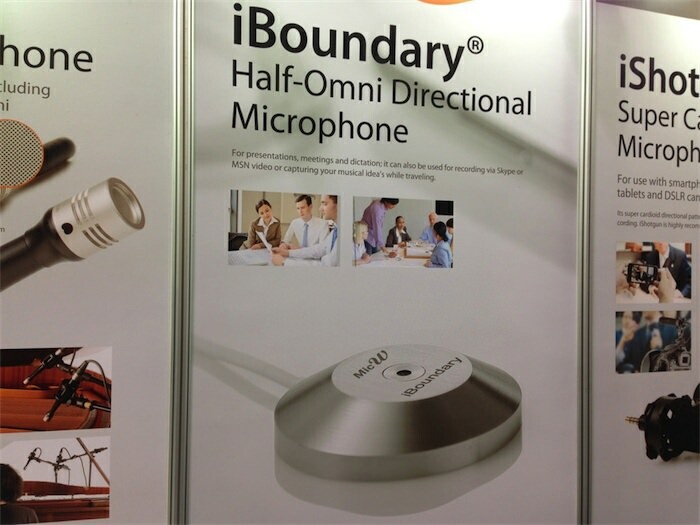 This is a surprisingly tiny boundary microphone for conference calls over a mobile device. It connects to the headphone jack, picking up vibrations from the air and table it sits on. Boundary mics for conference calls are nothing new, but this is the first time I've seen one designed specifically for mobile devices. Apparently Peavey has a custom shop. There was a performance happening every time I went into their giant room, so I didn't get to play this amp. A few thoughts about Peavey as a company. I like them because they seem scrappy. I don't own any Peavey gear, I actually know very few people who own Peavey gear. That's not a knock on them, just an observation. They're obviously a large, successful company, but for some reason they seem like scrappy underdogs to me and I like that. NAMM is the only place I see Trussart guitars. I have no idea how they play or sound, but they're easy on the eyes. I don't play my acoustic guitar very often. But when I do, it hurts my arm. 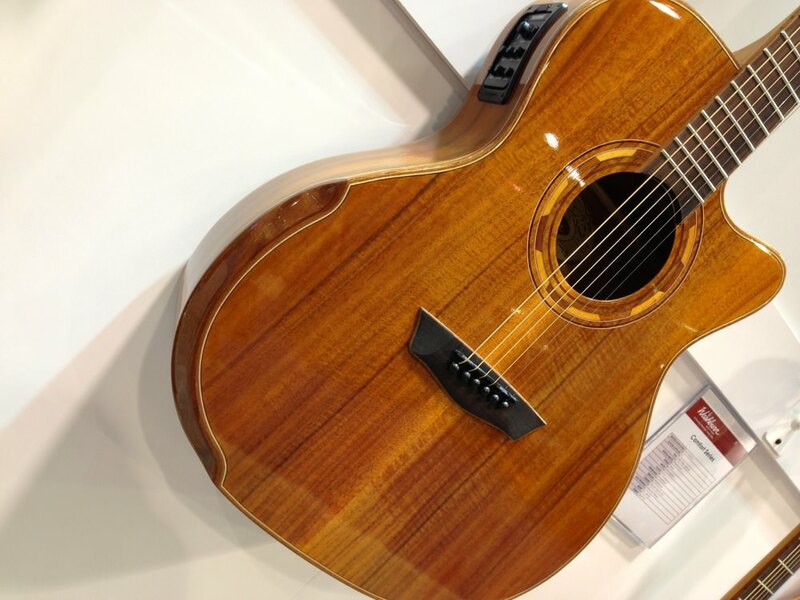 As I passed the Washburn booth, I saw this beautiful acoustic hanging on the wall. This model is part of their Comfort series and it has a nicely rounded edge right where your arm hangs over the front. Nifty. The Zexcoil crew streaming a live demonstration online, and I shot this clip of John Bendy playing a Zexcoil equipped guitar. John is an extremely talented, fluid, and snappy player who coaxes an extremely snappy tone from the pickups. Adam Levy (right) is a guitarist I met through my work with Truefire in 2012. Adam is a genuinely nice person, and an extremely tasteful guitarist. He toured with Nora Jones for more than a few years, and recorded the solo for 'Gimme One Reason' (don't believe everything you see). 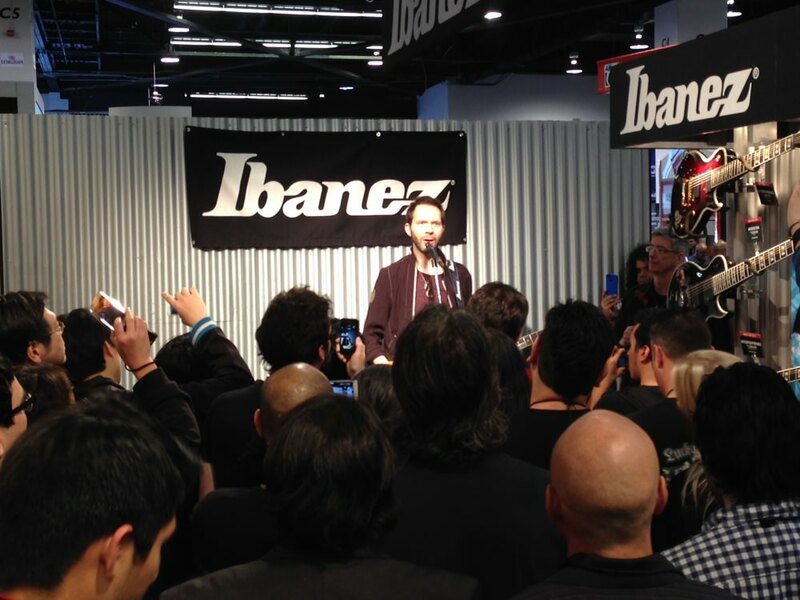 This year I caught up with him right before his show with a singer named Gaby Moreno. I knew nothing about her, but I became an instant fan when I heard the music and her amazing voice. 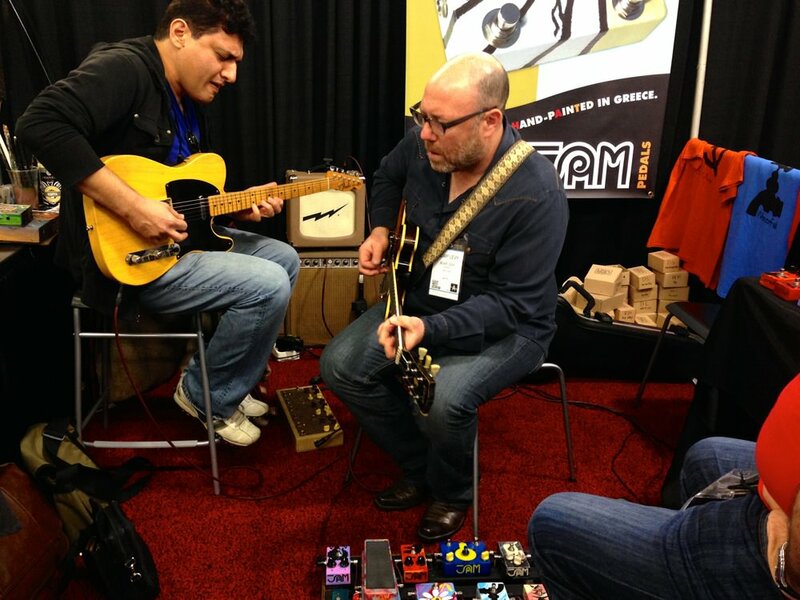 No pictures unfortunately, but I spent a good 10 minutes sitting in the Jam Pedals booth on Sunday. I really liked the Delay Llama. These pedals are hand built ó and hand painted ó in Greece. The builders seem like really nice people as well. At dinner, someone asked me "Why do you come to these shows?" My answer was simple. Where I live, there is virtually no music industry. Nobody 'in the industry' comes to State College, PA. There's nothing happening here. 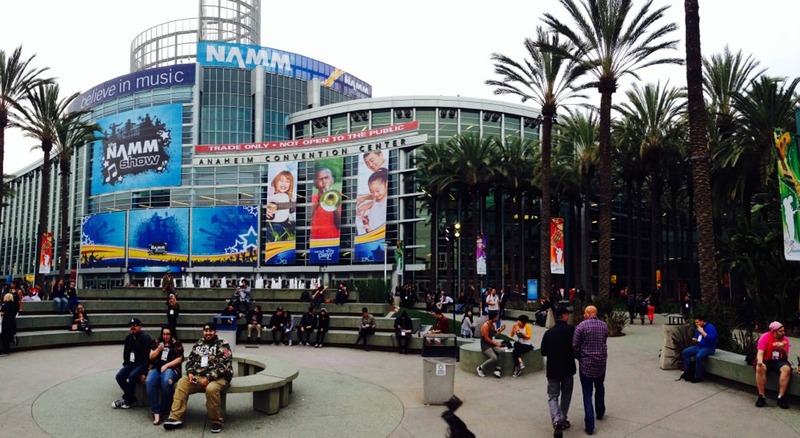 If I don't come to shows like NAMM, I never get to talk, in person, with anyone who understands what it's like to serve an international audience of guitar players.